The Drager DrugTest 5000 system is a fast, accurate means of testing oral fluid samples for drugs of abuse, such as amphetamines, designer amphetamines, opiates, cocaine and metabolites, benzodiazepines, cannabinoids and methadone. The analyser offers easy data management with the Drager Diagnostics Software. 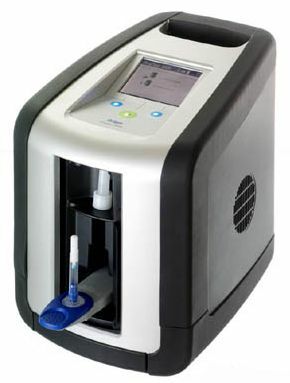 ORAL FLUID DRUG DETECTION - The Drager DrugTest 5000 System is comprised of two main components: the Drager DrugTest 5000 analyser and the Drager DrugTest 5000 Test Kits. Reliable and easy to use, the DrugTest 5000 analyser is a mobile oral fluid screening device for providing qualitative detection of drugs using the DrugTest 5000 Test Kits. QUICk AND PRECISE ANALYSIS - Providing reliable and precise analysis of an oral fluid sample within just a few minutes, this state-of-the-art optoelectronic system weighs less than 10 pounds. The analyser has a user-friendly, menu-driven, illuminated display which can be easily read, even at acute angles. CLEAR RESULTS STORED WITH DATA - The intrument interprets the results from the test kit, eliminating any possibility of human error in reading the results. The full color display indicates "Positive" or "Negative" for each drug type. With configurable software, data entry prompts can be customized to meet the needs of different applications. DATA MANAGEMENT - The integrated data memory stores up to 500 individual measurements for printing or upload to a PC. In addition to data management, the device has a self-test feature for temperature, optics and general operation. It can also be easily linked to a wide variety of data recording devices such as a PC, Drager Mobile Printer or barcode scanner. COMPLETE DETECTION SYSTEM - Combined with a carrying bag, the system can become mobile for on-thespot detection. A complete breath alcohol and drug detection system includes the analyser, mobile printer, keyboard, test kits, a Drager Alcotest handheld screening device and mouthpieces. Alcotest devices with mobile printing capability can print to the same Mobile Printer as the analyser. CONFIRMATION ANALYSIS - Positive results can be confirmed with a second oral fluid sample via an independent, third-party laboratory analysis using the gold standard method for evidential tests. Results are available online in a matter of days.